Increasing advancement in packaging technology for variety of end-use application increases the expectations that the demand will grow further in the next ten years. Manual tasks are quickly being replaced by automatic packaging machines in many industries. Most of the demand for packaging machinery is generated from the food & beverages industry due to significant growth in the consumption of the packaged food. New Formats Create The Need For New Solutions. New packaging formats in the e-commerce and food & beverages industry are gaining popularity which has created the need for development of product-specific packaging machinery. Packaging machinery manufacturers are innovating in terms of increasing the efficiency of existing products and the development of customized products according to the requirement of customers. Global demand for packaging machinery is growing and light speed. ORICS Industries is leading the way in terms of offering highly sophisticated and automated packaging machinery. These packaging machines are widely used in different end-use industries, prominently in the food & beverages industry, for products that are shipped in cups, tubs, trays, jars, bowls, etc. Form fill and seal machines are increasingly gaining traction in the emerging market due to the integration of three processes in a single system. More and more end-use companies are demanding integrated packaging machinery rather than purchasing different machinery for a specific application. Integration of packaging machinery has also propelled the demand for turnkey packaging machinery globally. At ORICS Industries, we’re finding new markets such as cosmetics, cannabis, tissue, and all sorts of consumer goods are increasing demand for integrated automation solutions. Are key markets remain Fresh Produce, Meat, Poultry & Seafood, Dairy/ Deli, Ready Meals, Medical & Pharmaceutical and Institutional distribution. Find out how we can help you to grow and stay competitive in your market. Call us for a free, no-obligation consultation and let’s discuss how we can make your packaging the best it can be. See Videos On Our YouTube Channel, Click Here. Food producers often operate within narrow margins and under high quality standards. When it comes to maximizing profitability and providing consumers with an even better product, automation can be a competitive edge. ORICS industries has been leading the way in the field of automated packaging systems for the food industry since 1990. Quality is the major concern for both food producers and consumers. Packaging automation enables suppliers to notice and isolate defects, ensuring faulty products do not enter the marketplace and underlying manufacturing faults are corrected. Automation can provide a more granular view of every step of food packaging. Producers can adapt more quickly to changes in safety standards because a change in one process will not introduce unexpected consequences in other areas. Traceability is a growing concern in the food packaging industry. By streamlining traceability, food producers can cut down on regulatory compliance costs and continuously improve key processes. Modified Atmosphere Packaging, M.A.P., using automatic systems like those ORICS provides enables suppliers to market food products at greater distances from the packaging origin. Modified Atmosphere enables fresh and minimally processed packaged food products to maintain visual, textural and nutritional appeal. The controlled MAP environment enables food packaging to provide an extended shelf life without requiring the addition of chemical preservatives or stabilizers. Food producers rely upon their brand reputation to maintain a good relationship with the end consumer. A single product recall or disease outbreak can be enough to shutter a business – and it can throw customers’ lives into chaos. In the end, automation means brand protection. diced sliced tomatoes packaging machine, This turnkey ORICS S-30 system is designed to minimize the number of human operators required for the packaging of diced tomatoes in 4 lb trays. Everything from the dicing of tomatoes to the placement in trays is fully automated, reducing the number of Operators from nearly a dozen to just 2 or 3. Featuring a Denester, Elevator Conveyor, Scale, Scale Interface, Heatseal and Outfeed, this system parallels the processing conveyors that utilize a screw infeed, an elevator conveyor, a dicer and washing/draining/transport system. This system represents a complete packaging system from start to finish and is just one example of how ORICS can increase your bottom line and streamline your applications. The ORICS S-30 2up Tray sealing line for cereal; denests containers, accurately deposits cereal and seals at speeds up to 50-60 containers per minute. The specially designed Eco-Cut Film-Feed mechanism allows for maximum material and cost savings. This Film Mechanism also includes film registration for accurate placement of printed film. This additional feature allows for reduced material usage for point of sale retail purposes. ORICS fully integrates with scales and other third party suppliers to create complete lines. The ORICS S-30 is available in many configurations to meet a variety of production requirements. ORICS Machinery is made in the USA. This ORICS S-30 10-up Cup Sealer is perfect example of a FDA approved ORICS pharmaceutical application. The ORICS S-30 fully integrates an OEM servo-driven piston filler and a unique robotic pick and place transfer system to create a complete turnkey solution. This system also features robotic foil lid placement and a 10-Head Platen Heat Seal. The S-30 is available in many configurations to meet a variety of production requirements. ORICS machinery is made in the USA. Orics Medical supply packaging machine and solutions. Visit our website at www.orics.com. Orics Medical Supply Packaging Machine cups and trays filling and sealing machines. Orics Pharmaceutical and medical supply packaging solutions. The ORICS S-30 1×3 heart shaped candy Chocolate tray sealing machine. This ORICS S-30 1×3 system was this candy manufacturer’s heart’s desire. Manually placed, chocolate-filled, heart-shaped trays are placed into the S-30’s carriers. Designed with manual loading in mind, the system is designed to wait until all the carriers are filled, prior to advancing into the heat seal sector (though that feature had been turned off for testing in our facility). This heat seal is one of the best examples of ORICS’ ability to handle unusually shaped trays. In fact, our floating heads design is uniquely appropriate for these unusually shaped trays, ensuring that a positive seal is achieved around the entire perimeter of the tray. Additionally, ORICS’ seal heads ONLY apply heat to the containers’ flange, ensuring that the product inside the trays remains cool and undamaged. This technique also saves you money as we do not heat the entire seal head; only the area directly over the flange. Like all ORICS products, the S-30 is manufactured in the United States at our Farmingdale, NY facility. For more information call 718-461-8613, visit us on the web at www.orics.com or email us at sales@orics.com. Home cooking pasta is an enduring tradition all over the world, according to market intelligence , pasta is also the most popular meal choice in restaurants. The increasing appeal and take-up of Mediterranean cuisine among global consumers has caused an explosion in the export of pasta, especially spaghetti, which is a type of long, thin and cylindrical pasta. Spaghetti is considered as a healthy alternative to fatty meal-time choices. The convenience of cooking a pasta dish – which takes just a few minutes – has also made it one among the go-to meal options for busy families. Annual world production of pasta stands at more than 12 million tonnes. EU countries dominate production, with dried pasta accounting for almost 95 per cent of the total domestic pasta production in some EU nations. The quality and choice of pasta products produced in EU is hard to surpass, and ORICS Spaghetti meal packaging machine or tray filling and sealing machine is an example of this validation that has seen European countries top the list of spaghetti packaging machine purchasing for tray filling and sealing– in all shapes and forms – to global consumers. 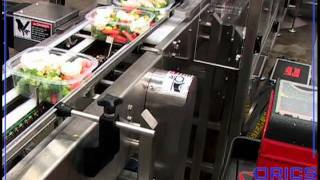 Watch Orics SLTS Tray Sealer Fresh Produce. 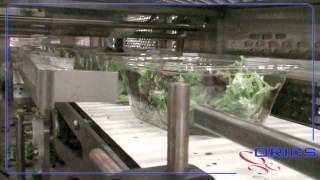 Watch Orics S-30 tray Sealer Fresh Produce. Orics will Get you the most out of your fresh produce with packaging solutions and proven controlled atmosphere packaging technology. Fresh produce is more susceptible to disease organisms because of increase in the respiration rate after harvesting. The respiration of fresh fruits and vegetables can be reduced by many preservation techniques. Modified atmospheres (MA), i.e., elevated concentrations of carbon dioxide and reduced levels of oxygen and ethylene, can be useful supplements to provide optimum temperature and relative humidity in maintaining the quality of fresh fruits and vegetables after harvest. Modified atmosphere packaging (MAP) technology is largely used for minimally processed fruits and vegetables including fresh, “ready-to-use” vegetables. Extensive research has been done in this research area for many decades. Oxygen, CO2, and N2, are most often used in MAP. The recommended percentage of O2 in a modified atmosphere for fruits and vegetables for both safety and quality falls between 1 and 5%. Although other gases such as nitrous and nitric oxides, sulphur dioxide, ethylene, chlorine, as well as ozone and propylene oxide have also been investigated, they have not been applied commercially due to safety, regulatory, and cost considerations. Successful control of both product respiration and ethylene production and perception by MAP can result in a fruit or vegetable product of high organoleptic quality; however, control of these processes is dependent on temperature control.